Hi! 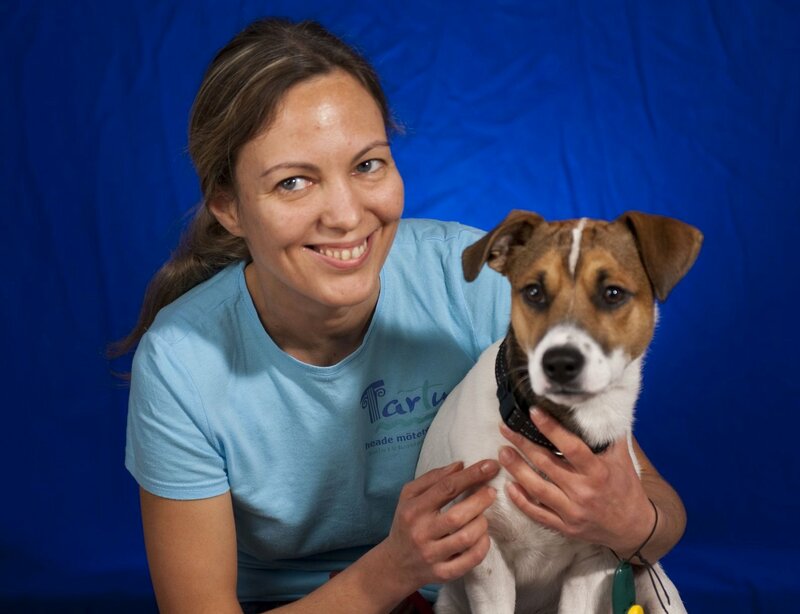 My name is Natali and here I am pictured with my first agility dog Oliver. We started to go to agility training in 2009 at our local dogclub Säde in Tartu. Olli as I call him was 9-months old at that point and none of the obstacles proved to be a problem for him. He was really fast and I was quite inapt. It took us quite a few years before we found a way of working which suited both of us. 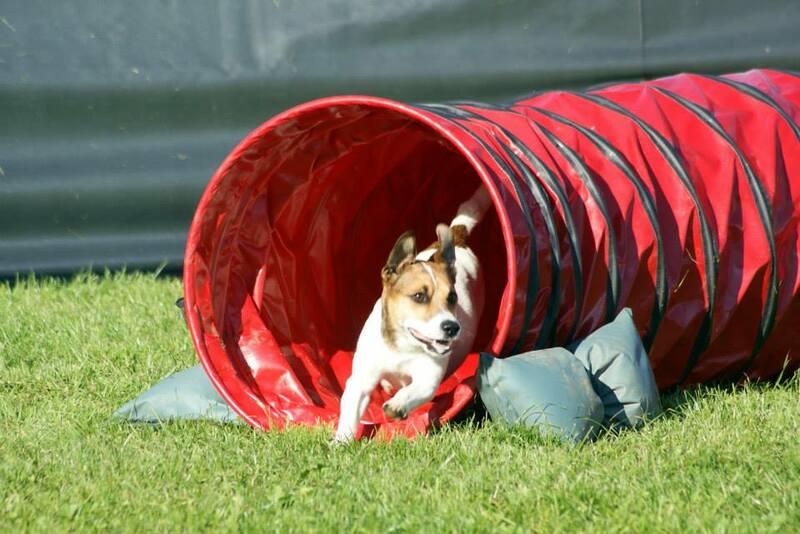 It is quite a challenge to teach agility to a quick, untiring and stubborn terrier. In order to succeed, I had to learn a lot of things in a short period of time. I had to be a trustworthy partner o my quick four-legged friend. 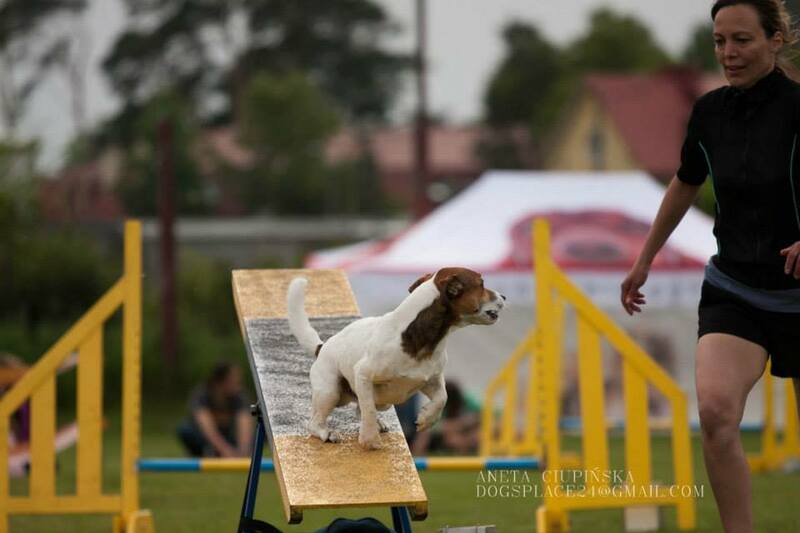 As time passed our cooperation started going smoothly and we both became great fans of agility. Besides agility, I took time to teach Olli tricks which in great part helped us to understand eachother better and do wonders to his ability to consentrate and observe. We started competing on the A1 level in november 2010. Oliver was really fast and I could barely keep up. In the heat of the moment, the leading techniques faded from my mind and I was really nervous. We made some mistakes but enjoyed the run out because the most important thing was to get that feeling of going through the course and cooperating with the dog. Video from agilitycompetition in Pärnu 18. 06.2011 , AG1 (judge Peteris Akimovs LV). Video from agilitycompetition in Haapsalu 23. 07.2011, AG1 (judge Henri Luomala FIN). I show these videos of us beginning because I want to encourage beginners in agility. One learns the most from personal mistake and it is important to preserve that motivation and willingness to work with your best friend. When training Oliver, the biggest challenge was to teach him contact obstacles: the dogwalk, the A-frame and the seesaw. At first he thought that the contact obtacles were to jump over an the 2on2off method did not work in a competition environment. It was difficult to have no hurdles fall down. Oliver was a fast runner and the hurdles would constantly be in his way. Of course my handling skills were far from perfect and did not favour clearing the course withour errors. Another problem for Olli was standing still at the start line. I learned to start with the dog. We managed to cross over to A2 in 2011. The supportive atmosphere and hard training at Säde dog club made us a stronger partnership. Oliver’s strengths have always been enthusiasm, speed, untiredness, lightning reactions, good contact with the handler, quick turns, strong clearance of the dogwalk and A-frame and perfect entrance to the slalom ( irrespective of the handlers position). Video from agilitycompetition in Pärnus 27.05.2012 , AG2 clean run, speed 4,67 m/s (judge Anne Tammiksalu EST ). Video from agilitycompetition in Helsingis SyysSkabat 2012, AG2 (judge Hans Fried AUT). It was nice corse except DSQ in the end. We have been competing in the advanced A3 level since 2012. The courses became more difficult. We took part in many agilityseminars tought by some strong agility coaches and this helped us to develop further. Competing consistenly in Estonia and abroad. As time passed I was able to train and handle Oliver better. Training and competing became very enjoyable. We re-learned the 2on2off contact obstacles to run-through obstacles (searching at the end of the contact surface). The hurdles stayed up for the most part, I was able to run at the same tempo as the dog, memorize the course and and we became more confident. Video from agilitycompetition in Helsingis SyysSkabat 2013, AG3 clean run, 3rd place 3/26 (judgeRitva Herrala FIN). Video from agilitycompetition in Tallinnas 19.10.2013 , AG3, clean run, 1st place 1/28, speed 4,83 m/s (judge Harri Huittinen FIN). 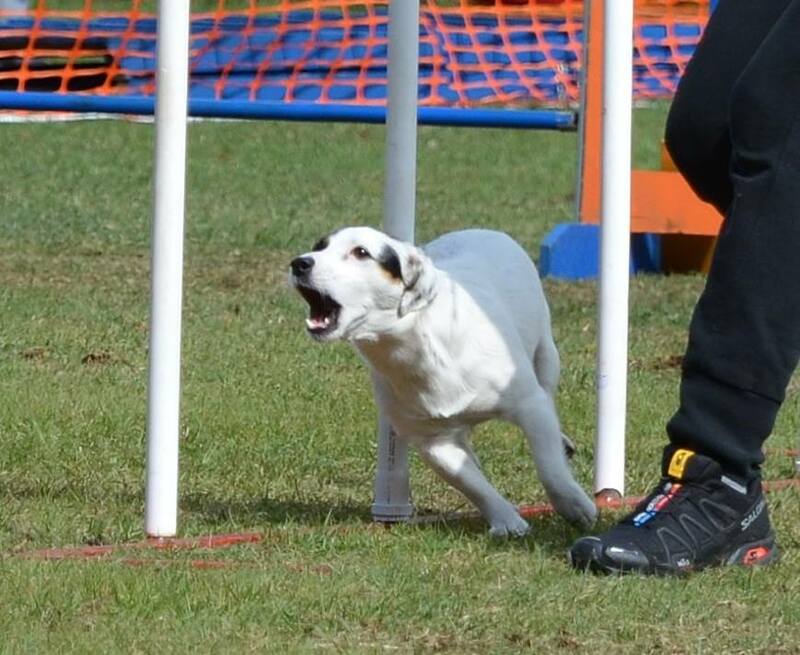 We have also taken part in two big international aqility competions: The International All Breed Cup 2013 in Poland (We recieved the 1st prize on the agility course in individual competition. Olli also had the fastest time on the SuperG tunnel course but we got 4th place because of a foul) and The Moravia Open 2013 in Czcech Republic. Video from Moravia Open 2013 (judgeJan Egil Eide NOR). Speed 4,44 (3rd time, but two mistakes), 21/46. In January 2014 Oliver’s agility career was cut short because he got seriously injured in a car accident. It is a miracle that he is still with us. The rehabilitation was long and difficult. We are sincerely grateful for all the work and support from Oliver’s doctors and friends. Oliver is an incredibly brave and vital dog full of life. He survived and now uses three legs to full extent. He still does agility as a hobby. Endy is a fine and aspiring agilityrussell. 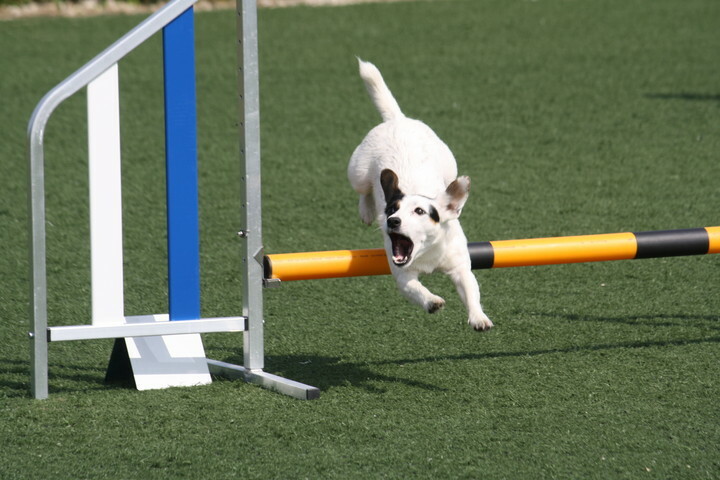 She started agility training as part of a group around one years of age. Before that she learned different tricks, turns, tunnels, touching etc at home. Endy was always in attendance when we were competing with Oliver. Endy likes agility a lot. Her favorite obstacles are tunnels, slalom, the dogwalk and the A-frame. Endy does not like jumping hurdles. We have practised hurdles and jumping techniques and I hope the situation will improve and Endy will become a better jumper. It seems that she doesn’t trust he hurdles and jumps from too far out and too high which results in a fallen hurdle. The quicker the course and the less time she has to adjust her step before the hurdle, the better she does. That is why I’ve started re-teaching her the 2on2off as a running contact. Her movement has become a bit better, her speed quicker and jumps a bit better aswell. 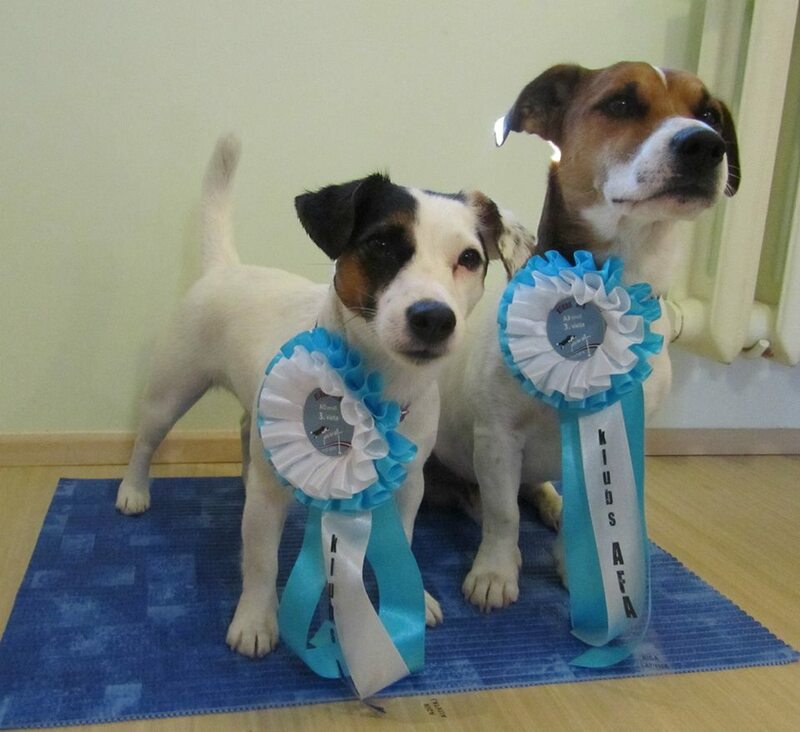 Endy has won 3rd prize the Estonian tunnel championship for beginners in 2014. At the moment she is competing in A1 level and helps me when I carry out trick and agility trainings. Our achievements in victories and titles aren’t great but the important thing is that we enjoy the sport. Our personal achievements and victories are the most important. Video from agilitycompetition "ROYAL CANIN VASARA" in Lithuania, Šauliai 29.06.14, OPEN, judge Anne Savioja FIN. Video from agilitycompetition in Tartus, AG1, jumping, clen run, 1st place (judge Marjo Heino FIN). 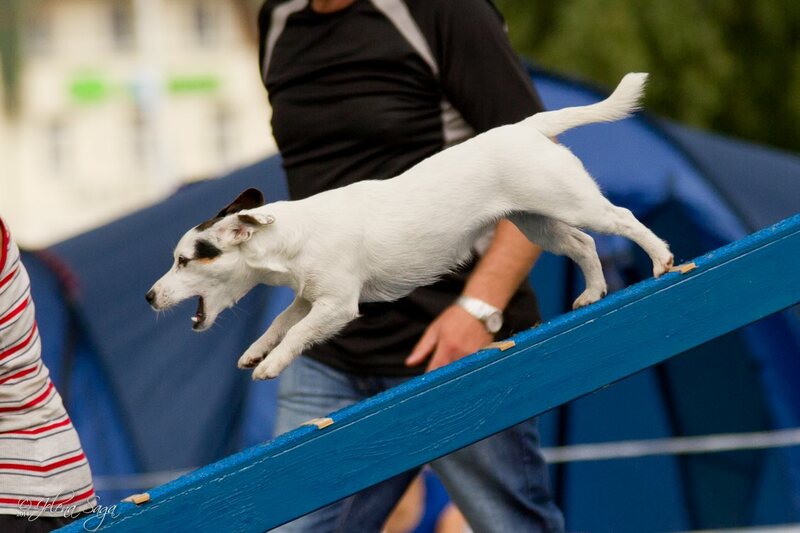 In February 2014, I started as an intern agility coach at the Tartu dog club Säde. My day job is also in consulting and training. My wide experiences in the field of adult education have helped me as an agility coach aswell.